WATERVILLE — Twice this season, the Brunswick boys’ lacrosse team squandered late leads and lost in overtime. Not a third time, though. Senior Andrew Eno completed his hat trick with 1:06 remaining, snapping a tie and thwarting Messalonskee’s fourth-quarter comeback and giving the Dragons a 12-11 win in a Kennebec Valley Athletic Conference Class B game at Thomas College on Wednesday. Messalonskee twice tied the game in the final three minutes, but Brunswick responded each time. Brunswick (7-2) also got two goals and four assists from junior captain Aiden Glover and two goals each from Henry Doherty and Jack McDiarmid. 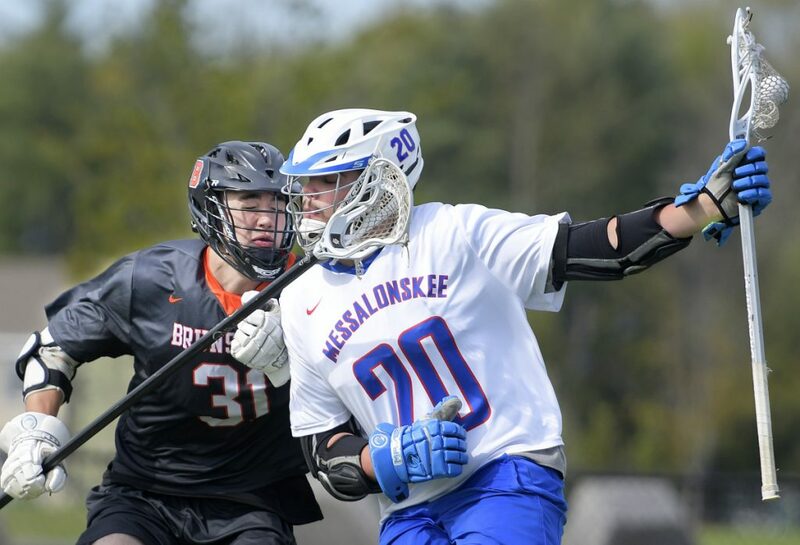 Messalonskee (4-4) lost for the third time in six days despite four goals and two assists from senior midfielder Austin Pelletier and a 14-save performance from junior Wade Carter. Colin Kinney had a hat trick in the loss, the Eagles’ second one-goal loss this season. Brunswick held a 10-8 lead with less than five minutes remaining. Dawson Charles scored to pull the Eagles to within one, then helped tie the game with 2:56 left when he separated Dragons goalie Connor Pendergast (eight saves) from the ball behind the cage, leading to an easy goal for Kinney. That test did not come without it’s nervy late moments. McDiarmid scored with the man advantage to put Brunswick back on top, only to see Kinney score again 16 seconds later. It set the stage for Eno’s winner off a quick-paced possession for the Dragons. In all, the teams traded four goals inside the final three minutes, including a span of three 1:32 apart. Glover might be the focal point of the Dragons’ attack, but he’s far from their only option. Seven players scored in the win.